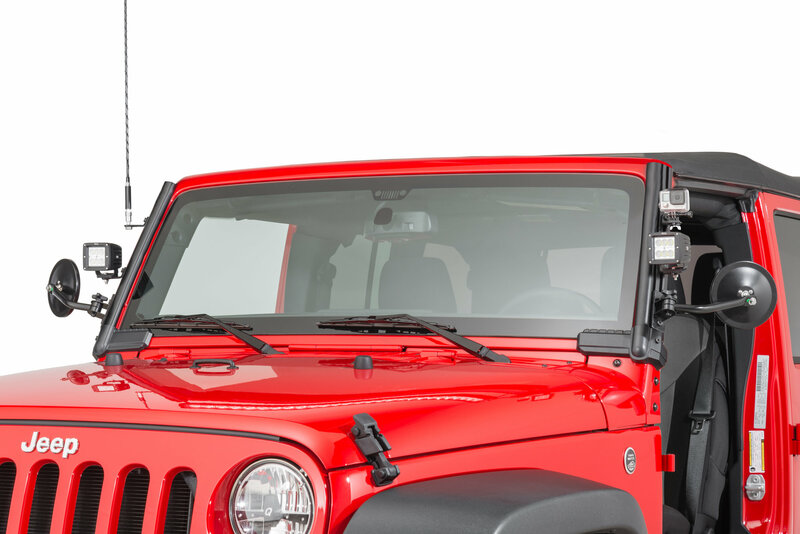 The new Elite Fast Track Windshield Light Bar Mounts by Rugged Ridge allow you to customize and configure auxiliary lights, relocation mirrors, GoPro cameras and more with endless possibilities. The Fasttrack Mount provides the perfect mount for virtually all 50” to 51” width range overhead light bars. The Elite Fasttrack Light Bar’s revolutionary vertical channels provide a conduit for hiding unsightly wiring and concealing it with vinyl covers and ABS plastic end caps. The stealthy design sets this innovative and versatile system apart from all other light mount solutions. 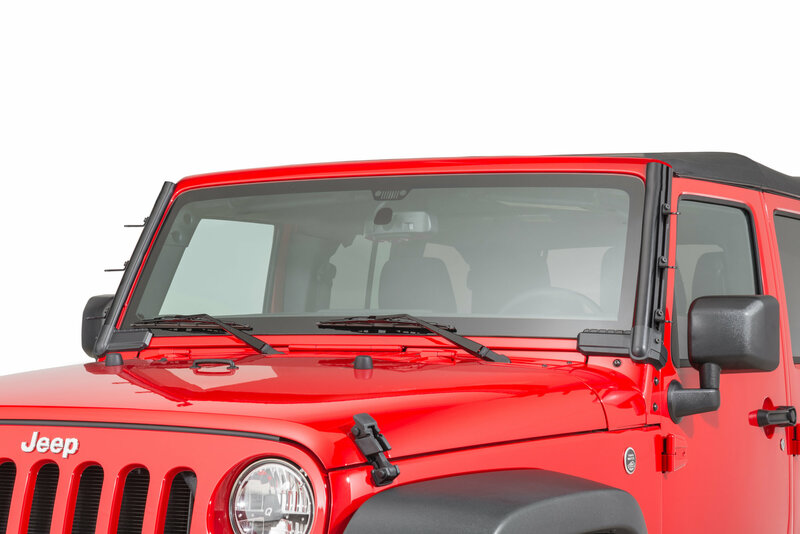 Constructed from 6061 T6 extruded aluminum, the Elite Fast Track Windshield Light Bar tracks provide an impressively strong “T” slide channel for complete adjustability of all your attached accessories. The Fast Track A-Pillar Mounts work with most 50” range LED light bars. Features a durable black textured powder coat finish for rugged durability and is covered with a 5-year limited warranty. 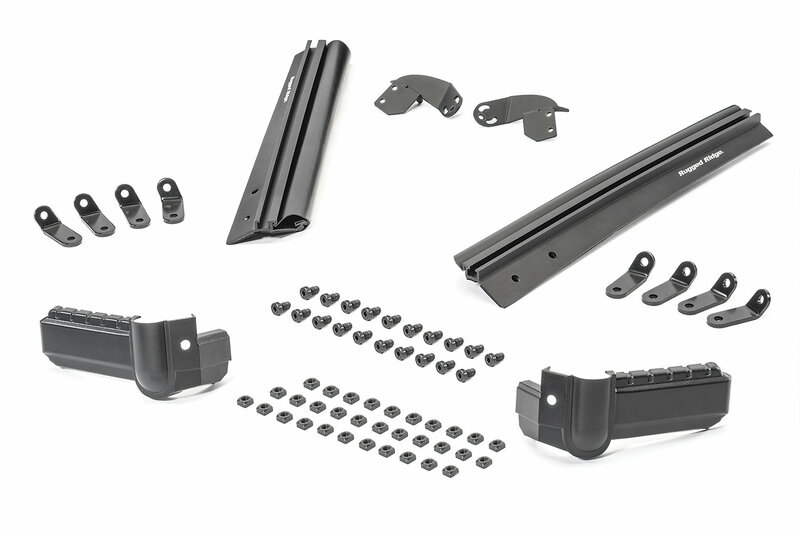 This Kit comes complete with eight A-pillar vertical accessory mounts, detailed installation instructions and hardware. Lights sold separately. Bought this as a set with the Rugged Ridge 50 inch light bar (also to be reviewed). Yes it bolts in easily, however the plastic wire cover that goes up the mount is worthless. In the 100 degree heat, it turns in to a limp noodle and flips around. The hard plastic cowl pieces that attach at the bottom of the mount do not seat properly along the windshield frame causing them to pop against the windshield at speeds over 40 mph. Finally at the top, there is a 1/4 inch gap which allows the wind to whip around causing a uhh pitch almost feedback noise. It’s not from the bar but from the mount. The bar was silenced. Don’t waste you time or money in this item. Spend a little more Nd get a better mount. I will be returning this item and do not recommend. Solid 4 stars. Good construction and assembled easily. Mounting was a quick too. The parts slide and bolt together easily - no fighting or pushing. Make sure you slide the conduit sleeves on before bolting the brackets to the A pillar, and watch the nuts. I put a piece of tape below to catch them. The A pillar fit was near perfect with maybe a little left to be desired with the wire cover ups that go down between the wipers and the cowling. No big deal but where this gets 4 stars instead of 5. I used an auxbeam 50 inch bar, and had to source some rubber washers (3/4ths of an inch worth on each side), but it looks good. I followed all the advice on the interwebz on the wind noise, and elected to use the automotive trim mouldings to keep noise down. there isn't any trace of excess noise. Overall a great setup. Time will tell on rust and other issues.